We headed out on an adventure yesterday morning to a nearby tree farm to find a Blue Ice Cypress before the impending winter weather arrived. As it turned out, we timed our trip perfectly. 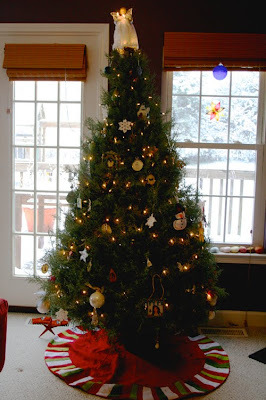 We picked out, cut down and hauled home our tree, and just as Paul situated the tree in it's stand, fat white flakes began falling from the sky. 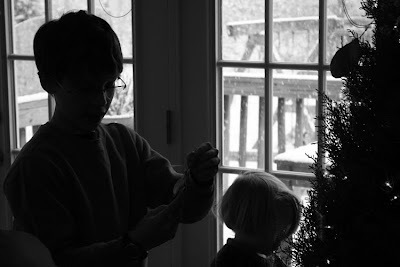 For the first time in my life, we decorated the tree as snow fell by the window beside us. 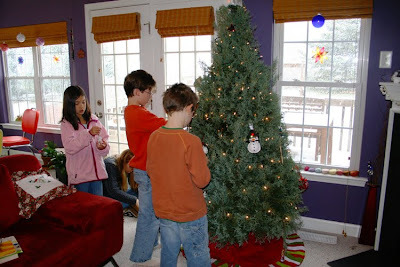 Tree decorating, pulling out each ornament and remembering the time and place each ornament was selected or remembering the Christmas each child received a special ornament as a gift, was made even more special by the snowy weather. As though heaven itself was blessing our beautiful time together. What a wonderful treat! 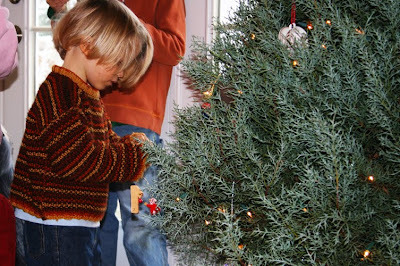 Poor Finn, our Christmas baby, thinks that every holiday activity means his birthday has finally arrived. "Our tree is decorated! Is it my birthday now?!" Not quite yet, Finn! I don't normally post a photo of our Christmas tree. Photos never seem to do justice to the sentimental wonder that is each year's tree adorned with our precious ornaments and memories. However, I couldn't resist this time with the snow piling up behind the tree. And as for the snow...well, it kept my children occupied for the better part of 3 hours. 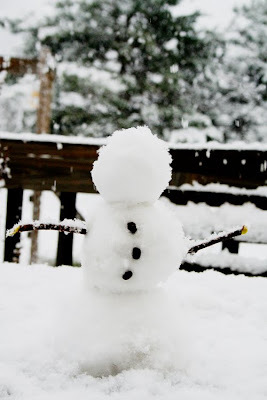 Paulie built this little snowman with little coffee bean buttons and then Finn proceeded to knock it down with snowballs while Elizabeth and Paulie staged a snowball war with one another. As usual, there was plenty of snow eating. Apparently they aren't as discerning as Lucy. Finn finally had his first really enjoyable snow play. Last year, we kept getting 6+ inches of snow at a time which was very intimidating for a just-turned 3 year old with snow up to his knees. 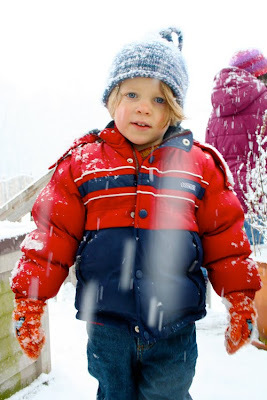 Finn usually takes a while to wake up from his nap, quite crankily, I might add, but yesterday he practically darted out of bed and into the backyard for more snow play. After all that physical outdoor play, I had some very hungry children so I tried out this hearty new recipe. I used the cream cheese pastry from 3191, except I used 1/2 whole wheat bread flour instead of all white, and split the dough into 2 disks to refrigerate. While they were refrigerating the required 30 minutes, I sauteed a large onion and steamed 3 cups of various other veggies (last night I used a combination of lima beans, green peas, shredded carrots, corn, and broccoli) for 6 minutes. While the veggies were steaming, I whisked 3/4 cup veggie broth with 1/3 cup of flour. When the veggies were done steaming, I added them to the onion pan and mixed in 1/2 tsp sage, 1 tsp thyme, 4 cloves crushed garlic and 1 tsp salt. I rolled out the first disk of dough and pressed it into a 10 inch cast iron pan. I poured all the veggies into the pan then poured the broth mixture over the veggies. 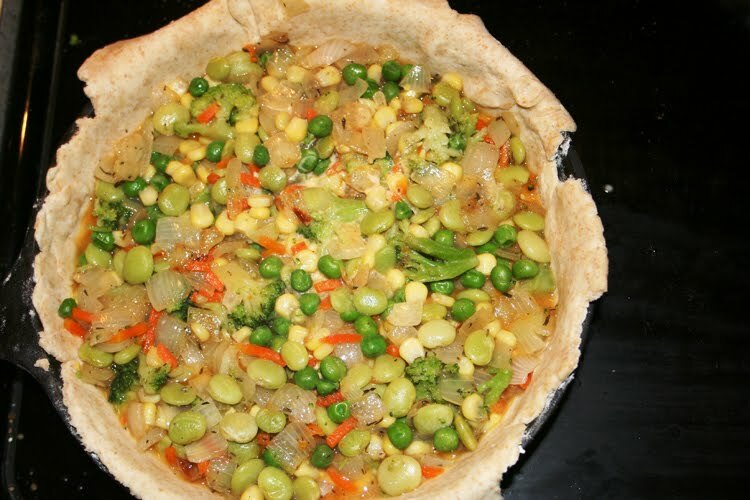 I rolled out the second disk of dough and placed it over the veggies then crimped the crust together around the edges cutting off the extra chunks. Then I sliced 5 Xs into the top crust. I baked the pot pie at 400° for 45 minutes until the crust was deep golden. 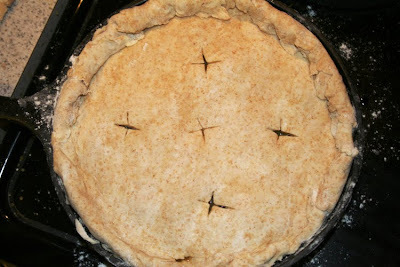 This pie made 6 perfect wedges and was heartily received by the kids. 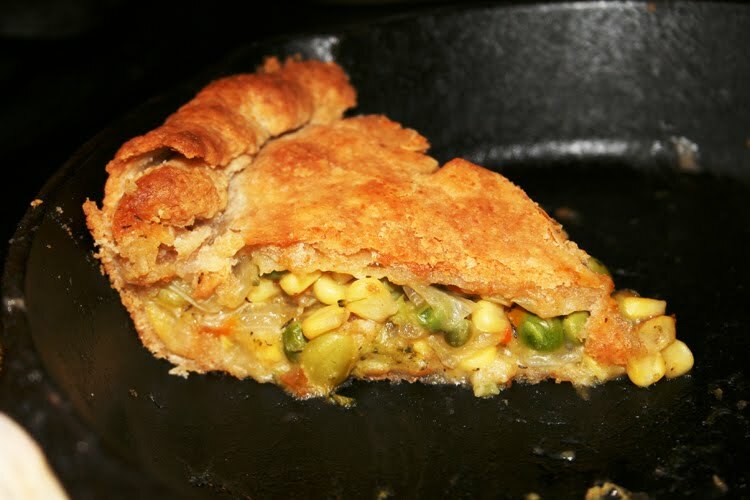 I have to say that even though veggie pot pie isn't on the top of my list of favorite meals, this was really a delicious version. We will definitely have this again soon! 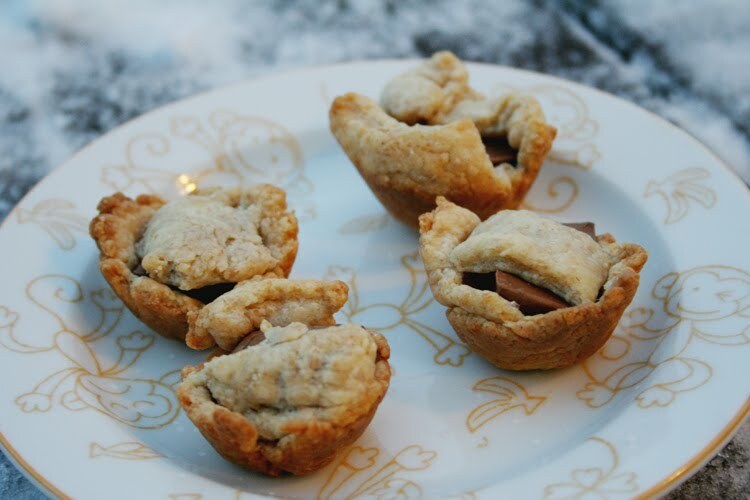 Of course, I couldn't let those scraps go to waste, so I wrapped a couple squares of organic milk chocolate in a bit of dough and placed them in a small muffin tin. The kids were delighted with their surprise dessert made from the scraps of their dinner. A perfect snowy December weekend! Wasn't the snow magical! Looks like you had a perfect tree trimming day. I can't wait to try out this pot pie recipe. I adore pastry crust with gooey veggies! What a special treat for your weekend! The snow, the tree, the food...it all looks so good. Your Christmas tree is gorgeous! The picture of Elizabeth eating the snow made me laugh. Marta won't stop eating snow every time we are outside. Her cheeks get so red and I~m scared shell have tummy ache!